Description: Are you feeling LUCKY? Only 500 tickets will be sold and they’re going FAST! Tickets are $125 for a chance to win a $25,000 voucher that can be used at Days Chevrolet, Jasper Jeep, Shottenkirk Ford, Ag-Pro John Deere, Goss Equipment, Nelson Tractor, or R & R Trikes. Or you can take the $15,000 cash option. 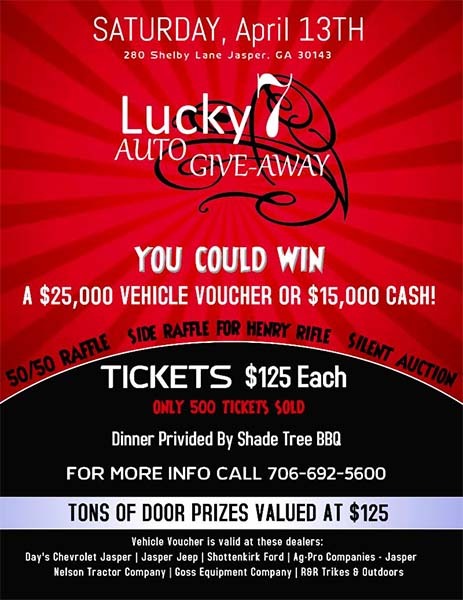 Tickets also include dinner for 2 from Shade Tree BBQ.